High Energy Incoloy Elements - provide fast recovery. 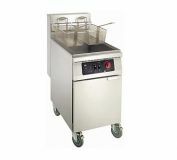 Robertshaw High Limit and Automatic Temperature Controls - insure accurate, safe fryer operation. Conserve energy and save money. Melt Cycle Controls - standard on all models. Oversized, Full-flow 1.25'' Drain Valve - makes draining effortless. All Controls Are Easy To Service and Accessible From the Front of the Fryer.